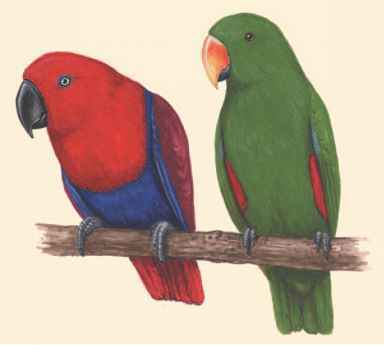 Physical characteristics: The coloring of male and female eclectus parrots is so different that they were once thought to be two different species. The female bird has red and blue feathers and a black bill. The male has green plumage and a yellow bill. All eclectus parrots have feathers of a smooth texture that have been compared to silk. The birds are 16.5 inches (42 centimeters) in length and weigh 0.9 to 1.2 pounds (440 to 660 grams). nearby islands, the Solomon Islands, Admiralty Islands, Bismarck Archipelago, and the Cape York Peninsula in Australia. Habitat: In the rainforest, eclectus parrots often live in tall trees with nests located 72 feet (22 meters) or more from the ground. The birds also live in trees in grassland. Diet: Eclectus parrots eat nuts, seeds, fruits, berries, and nectar. Behavior and reproduction: Eclectus parrots are monogamous and are believed to breed year-round. However, they are thought to mate mostly between August and January. Birds are group-oriented, and there may be four nests in a tree. 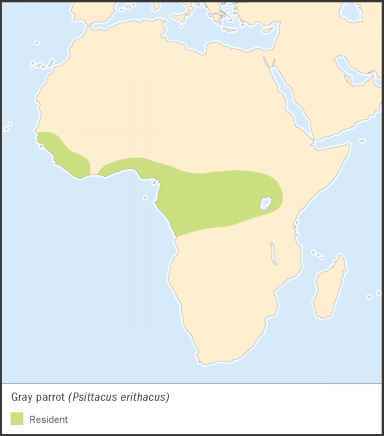 The parrots are cooperative breeders, parents are helped by other birds. The assistants are thought to be offspring or adult relatives of the expectant parents. The female has a clutch of two eggs that hatch in twenty-six days. 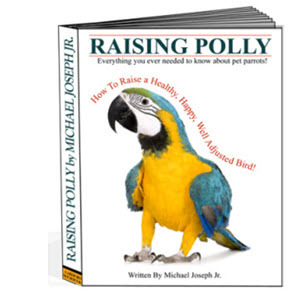 Eclectus parrots and people: Eclectus parrots are popular cage birds. While people in their native lands sometimes keep them as pets, some people are upset when wild parrots steal their fruit.